Monica writes: Twenty years ago, we were moving from Finland. 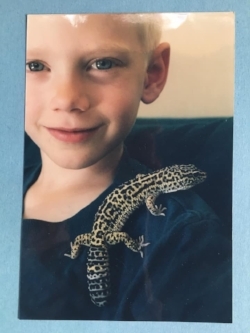 Mika was sad to leave his leopard geckos behind. His only consolation was that he could get two pet rats (Bert & Ernie) once we were in the States. This is my favorite photo of him. His eyes were so trusting of us. Recovery is an unrealistic standard for any chronic illness, including mental illness. We would never apply the blanket expectation of recovery to any other chronic illness or disability. With cancer and autoimmune disorders, we use the term “remission” to describe a life-threatening systemic illness that with luck and treatment has been stopped in its tracks. With other chronic illnesses like diabetes, we talk about managing the illness. But with mental illness, we expect people to “choose” recovery, even when they are experiencing psychosis, or when their disease steals their ability to make rational choices. Behavioral health is an important concept for everyone. We should all focus on our behavioral health: on diet, exercise, mindfulness, good sleep habits. But behavioral health is not mental illness. Mental illness is physical illness. For people with serious mental illness, behavioral health alone will not “fix” or “cure” the chronic condition, and for us to expect otherwise is unrealistic and cruel. We need to focus on effective treatments, not inaccurate judgments about what we “believe” or “feel” mental illness is. It’s a very real health challenge, with real and sometimes devastating consequences for those who live with it and their families. Let’s keep talking about behavioral health for everyone. But let’s stop talking about recovery for serious mental illness and start celebrating people whose brain disorders cause them to live with health challenges comparable to those experienced by cancer patients. The word we need, in the face of so much loss, is hope. Mental illness is not a choice. But hope is. Even in the face of tragedy, today I choose hope. Our son, Mika, was diagnosed with schizophrenia this summer. We knew he was ill for a few years but didn't know what it was. He decided that he couldn't live with this disease and took his life Wednesday night. Time has stopped yet the world is still turning. My heart is beating but my body feels like stone. Everything feels like a contradiction. We are well acquainted with sorrow and know that grief is just love with no place to go. Note: Monica lives in Montana. Monica writes: About ten years ago, this photo was taken of Mika on the lake near the summer house. It kind of represents his reality and broken reality in the reflection.